We will refer to TDN as the “Service”. We (that is TDN and its other business groups and affiliates) will provide the Service to you, subject to the following terms and conditions – referred to as the “Service Agreement” or “SA”, which may be updated or modified by us from time to time without notice to you. Therefore you need to regularly check this agreement to stay up to date. You can review the most current version of the SA at any time at www.thoroughbreddailynews.com. Your use of the Service will confirm your agreement to these terms and conditions as well as your acceptance of the changes we make to the SA. 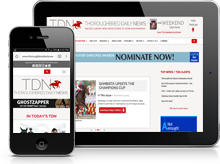 TDN is an online directory service of thoroughbred industry information. Unless explicitly stated otherwise, any new features that augment or enhance the current Service shall be subject to the SA. You understand and agree that the Service is provided “AS IS” and that we do not assume responsibility for the timeliness, deletion, mis-delivery or failure to store any user provided content, communications, or personalization settings. In order to use the Service, you must obtain access to the World Wide Web, either directly or through devices that access web-based content, and pay any service fees associated with such access. In addition, you must provide all equipment necessary to make such connection to the World Wide Web, including an internet connection. In return for our enabling you to use the Service, you agree to: (a) provide true, accurate, current and complete information about yourself when necessary or as prompted by the Service’s registration form (such information being the “Registration Data”) and (b) maintain and promptly update the Registration Data to keep it true, accurate, current and complete. If you provide any information that is untrue, inaccurate, not current or incomplete, or we have reasonable grounds to suspect that such information is untrue, inaccurate, not current or incomplete, we have the right to suspend or terminate your account and refuse any and all current or future use of the Service (or any portion thereof). The Thoroughbred Daily News is a publication of Media Vista. Our postal address is 60 Broad St, Suite 100, Red Bank, NJ 07701. We can be reached via e-mail at [email protected] or you can reach us by telephone at (732) 747-8060. The information gathered when you interact with the TDN falls into two categories: 1) Personal information, which includes personal information you supply when you subscribe, order, complete a survey, register for one of our sites, enter a contest or provide your email address and 2) Non-personal information collected through technology, which includes tracking information collected by us as well as third parties. We collect information from users during the registration process and, occasionally, at other times, including surveys. For each visitor to our Web page, our Web server automatically recognizes the user’s IP address, but not the e-mail address (where possible). We collect the IP address, but not the e-mail address of visitors to our Web page, the e-mail addresses of those who communicate with us via e-mail, aggregate information on what pages users access or visit, user-specific information on what pages consumers access or visit, and information volunteered by the consumer, such as survey information and/or site registrations. The individual user-specific information we collect is used for internal review, to improve the content of our Web page and is never shared with other organizations. We will share aggregated demographic information with our partners and advertisers. This aggregated information is not linked to any personal information that can identify any individual person. On occasion, we will share user information with advertisers or potential advertisers, including the identity, use statistics and certain other information, except e-mail and physical addresses, concerning users. Separately, we store your name and email address in our Constant Contact account until you no longer wish to subscribe to the email service, or ask us to delete your information. Device Information. We may collect non-personal information about the computer, mobile device or other device you use to access the TDN, such as IP address, geolocation information, unique device identifiers, browser type, browser language and other transactional information. Cookies and Pixel Tags: We automatically receive and store certain types of non-personally identifiable information whenever you interact with us. For example, like many websites, we use “cookies” and “web beacons” (also called “clear gifs” or “pixel tags”) to obtain certain types of information when your web browser accesses our Website. “Cookies” are small files that we transfer to your computer’s hard drive or your web browser memory to enable our systems to recognize your browser and to provide convenience and other features to you. “Web beacons” are tiny graphics with a unique identifier, similar in function to cookies, and may be used to track the online movements of users, when an email has been opened, and to provide other information. Examples of the information we collect and analyze in this manner include the Internet Protocol (IP) address used to connect your computer to the Internet; computer and connection information such as browser type and version, operating system, and platform; your activities on our Website, including the products you view or searched for, as well as the URL you come from and go to next (whether this URL is on our Website or not); and cookie number. It is important to note that the cookies and Web beacons that we use do not contain, are not tied to, and are not used to automatically collect any personally identifiable information about you. Some of the services and advertisements included in the TDN or on the TDN website within our mobile app, are delivered or served by third-party companies, which may collect information about your use of the TDN Services. These companies may place or recognize cookies, web beacons or other technology to track certain non-personal information about our website users. For example, in the course of serving certain advertisements, an advertiser may place or recognize a unique cookie on your browser in order to collect certain information about your use of the TDN website. For another example, an advertiser or ad server may also be able to collect your device’s unique identifier in the course of serving an ad. In many cases, this information could be used to show you ads on other websites based on your interests. If you would like to opt-out of having interest-based ad targeting, click here. Your access to our website should not be affected if you do not accept cookies served by third parties. We may use demographic and preference information to allow advertising on the TDN website to be targeted to the users for whom they are most pertinent. This means users see advertising that is most likely to interest them, and advertisers send their messages to people who are most likely to be receptive, improving both the viewer’s experience and the effectiveness of the ads. We disclose information to third parties only in aggregate or de-identified form. You agree that TDN, in its sole discretion, may terminate your account (or any part thereof) or use of the Service, and remove and discard any Content within the Service, for any reason, including, without limitation, for lack of use or if TDN believes that you have violated or acted inconsistently with the letter or spirit of the SA. TDN may also in its sole discretion and at any time discontinue providing the Service, or any part thereof, with or without notice. You agree that any termination of your access to the Service under any provision of this SA may be effected without prior notice, and acknowledge and agree that TDN may immediately deactivate or delete your account and all related information and files in your account and/or bar any further access to such files or the Service. Further, you agree that TDN shall not be liable to you or any third party for any termination of your access to the Service. Information as to the American races, race results and earnings was obtained from results charts published by The Jockey Club Information Services and utilized here with their permission. No part of this work covered by this copyright may be reproduced in any form or by any means without written permission of the copyright owner, Media Vista Inc. or Thoroughbred Daily News. The above copyright and disclaimer applies to any inquiry run during any session on ThoroughbredDailyNews.com, or to any information retrieved from our World Wide Web Site now or in the future. Payment is due within 30 days of date of invoice. A 1.5% per month carrying charge will be added to delinquent accounts. In the event the account is turned over to an attorney or collection agency for collection, the reasonable cost of collection will be charged to the advertiser and the advertising agency, including without limitation attorney’s fees, collection agency fees, and court costs. Advertiser and advertising agency consent to the personal jurisdiction of the courts of the State of New Jersey in the event an action to collect a delinquent account is brought. Insertion orders must specifically state magazine, issue(s) and space to be used. TDN will not be bound by any conditions appearing on or accompanying insertion orders, or copy instructions when such conditions conflict with or supplement the terms and conditions set forth herein and in the rate card, unless specifically agreed to in writing by TDN. All advertisements are published upon the understanding that the advertiser and the advertising agency (if any) assume full and complete responsibility and liability for the content of all advertisements submitted for publication. Advertiser and the advertising agency warrant that all advertisements comply with all applicable federal and state laws and regulations. The advertiser and the advertising agency each represent and warrant that the advertisements will not contain any matter that is false, deceptive, misleading, obscene, disparaging or libelous, or that violates any person’s right of privacy or publicity, or infringes on any copyright, trademark or confidentiality right. TDN is not responsible for errors in typesetting or otherwise done by TDN. The advertiser and the advertising agency each agree to indemnify and hold harmless TDN and its employees and representatives from any and all loss, expense, or other liability, including attorney’s fees, arising from any claims based on a breach or alleged breach of the foregoing representations and warranties. TDN reserves the right, in its sole discretion and without liability, to reject any advertising order for any reason at any time with or without notice to the advertiser or advertising agency, and regardless whether such advertising was previously accepted or published. TDN may, in its sole discretion, alter or reject any advertisement that contravenes its policies or that in its opinion is or may be false, misleading, disparaging, or may expose TDN to any claim or liability. TDN’s failure to exercise this right shall not relieve advertiser and advertising agency of their warranties and obligations under paragraph 3 above. In the event an order is placed by an agency on behalf of the advertiser, such agency warrants and represents that it has full right and authority to place such order on behalf of the advertiser. The advertiser and its agency each agrees to be jointly and severally liable for TDN’s charge for each advertisement placed. Thus, TDN may recover its advertising charges from either the advertiser or the agency, regardless of the relationship between the advertiser and the agency and without regard to any contrary provision in any insertion order, purchase order, or other document.